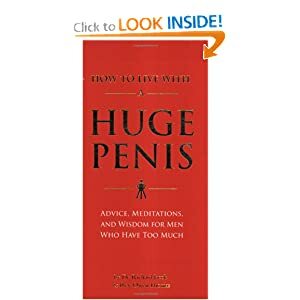 Did someone *really* have to write a book about how to live with a Mighty Wang? And you can buy it, right here. ** I still cannot see any comments on the blog on my two home computers. I find this very ironic. However, I may just can JS-Kit completely if I can’t get it fixed by Monday. Just a heads up if the comments start looking wonky next week. I think I should buy this and, like, accidentally leave it on my desk at work for everyone to see. No one would ask me about it, but the expressions on their faces at the next staff meeting would totally be worth it.